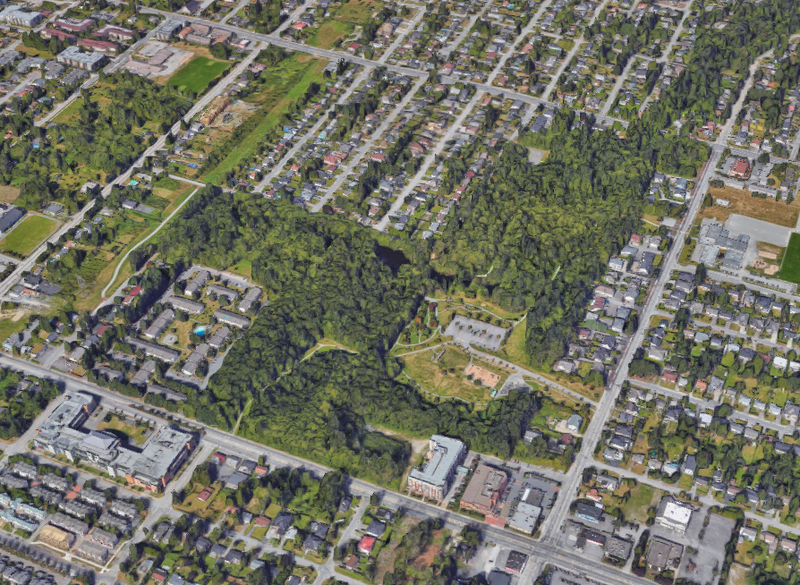 On Monday, Surrey Council authorized staff to move forward with an Alternative Approval Process to remove a 1979 bylaw reserving a portion of lands in Hawthorne Park for park purposes. The bylaw, which applies to 6 properties (shown on the map below), currently preserves the properties for park purposes. 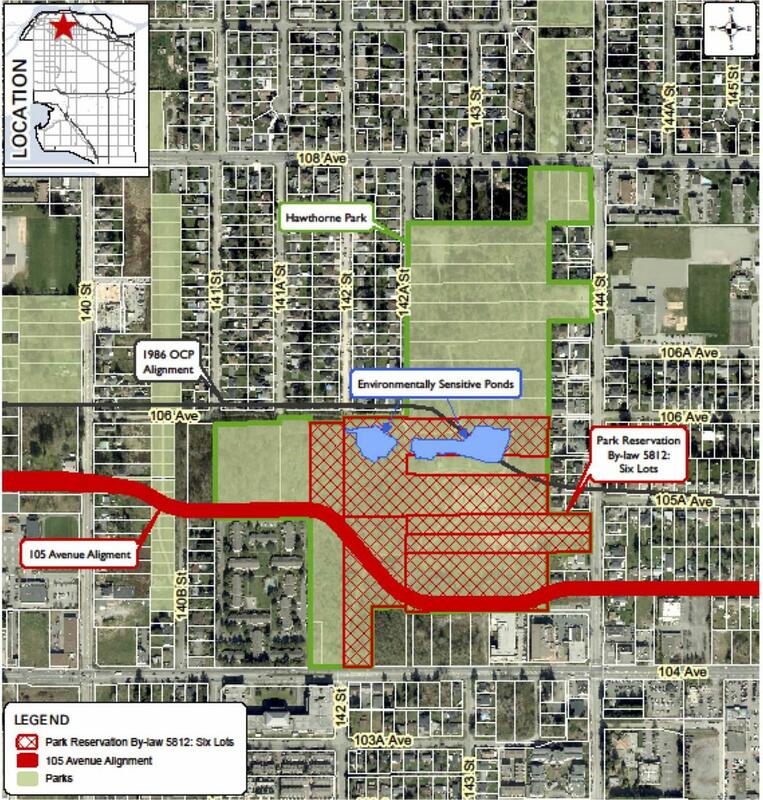 City Staff want to construct a new portion of 105 Avenue through the properties as part of an east-west connector road project which has been planned since the 1980’s. An ‘Alternative Approval Process’ will now move forward involving the public, with aim to remove the 1979 Bylaw and allow for the road’s construction. Careful alignment of the proposed 105 St to minimize environmental impacts. The proposed roadway will be a narrow, 2-lane cross section through the park with no on-street parking to minimize impacts. 200 additional trees from what exists today will be added to the park. Addition of new bike lanes and sidewalks on 105 St improving accessibility to the park. 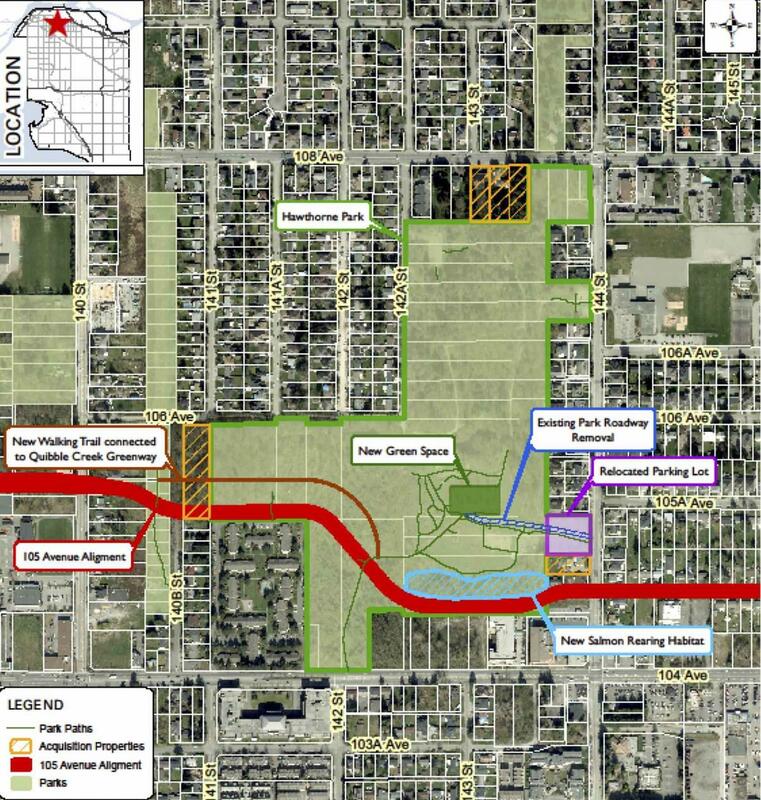 A previous proposed connection to 142 St has been removed from the current proposal to preserve more trees and parkland. A new salmon rearing habitat to be added north of 105 St within the park. Relocation of the existing Hawthorne Park parking lot and access roadway to a more efficient location, allowing for more green space within the park. New walking trails to be established through the park. While the plan for the 105 St connector through the park has been in place since 1987, the 1979 bylaw has prohibited the road from actually being constructed. While well intended at the time, the bylaw has since become outdated, put in place nearly 4 decades ago when Surrey was much less developed. In the current context of a rapidly growing city, the 105 St connector is an important piece of infrastructure needed to meet current and future transportation needs, as well as servicing demands within Surrey. The connector will also provide an alternative route to 104 Street, which is designated to become a transit-prioritized and oriented corridor in the near-future with the addition of LRT. The minimal loss of 4 acres of parkland within the 57 acre park (which will then be recuperated through the addition of 5 new acres of parkland) is a negligible price to pay for the greater community good of improved connectivity, accessibility, and overall improvements to the park.